Tuesday morning is going to be a really close call. I work about 30 miles north from where I live, and that looks like the demarcation line for the rain/snow. NAM shows the temp profile riding the zero degree line with precipitation for a good part of the morning in that area. Yesterday it was showing all snow, now a mixed bag. What a difference a couple of degrees can make. The National Weather Service has now issued Winter Storm Watches for a vast area of the Deep South region , mainly for Tuesday. The watch extends from Northern Louisiana through North and Central Mississippi, North and Central Alabama, and Northwest Georgia.The watch area includes the Atlanta metro. Winter Storm Watch also posted for the Tennessee Smoky Mountains and the Western North Carolina Mountains. Jag95 wrote: Tuesday morning is going to be a really close call. I work about 30 miles north from where I live, and that looks like the demarcation line for the rain/snow. NAM shows the temp profile riding the zero degree line with precipitation for a good part of the morning in that area. Yesterday it was showing all snow, now a mixed bag. What a difference a couple of degrees can make. Good luck man. I wouldnt be surprised if a stray flake or two falls over here but being off the immediate coast a few miles, maybe you'll see a little more over there. Wish I could find a work excuse to get up to Jackson, but that ain't happening. Jackson NWS shifted their prediction for highest snow rates slightly SE to a line from Natchez Trace to Brookhaven to Meridian. 1-3 inches with possible higher totals. Not too far from Hattiesburg. I guess we're about to find out if they can pull it off again. Amounts trending slightly higher here in N ga, 2" or so. Snow line seems a little odd for the area with this setup but we are at zero so far on the season (avg 8") so anything is something at this point. I'd settle for flurries right now because I'm just not feeling it this far south. A snowball would be a bonus. All of our snows are borderline, which should be expected I guess. There's always Colorado. The towel is in the middle of the ring. Just looking at early morning news from Jackson and it looks like very little accumulated. Just judging from the pictures, maybe 1/4 - 1/2 inch? That might be overly generous. Twitter pictures from Hattiesburg look like a thin dusting on car windows; only gathering on the lower halves of windows where it accumulated from gravity. Sad. There's certainly a cold, blowing, light rain here in Biloxi. Agua wrote: Just looking at early morning news from Jackson and it looks like very little accumulated. Just judging from the pictures, maybe 1/4 - 1/2 inch? That might be overly generous. Twitter pictures from Hattiesburg look like a thin dusting on car windows; only gathering on the lower halves of windows where it accumulated from gravity. Sad. There's certainly a cold, blowing, light rain here in Biloxi. Those of you in Mobile never really had much of a chance of snow. Beware a GFS-indication of snow behind a front, as the model is not taking into consideration the full vertical temperature profile. Here is a model sounding from last evening's GFS for Mobile. It shows the lower 6000-7000 ft above freezing at 6am this morning with a surface temp of 47 degrees. Snow was melting as it dropped into the lower 6000 ft of above-freezing air. Mobile reported a temperature of 48F at 6am, by the way. Yep, was a bust here.. temps were 5-7 deg higher than anticipated when the moisture arrived. I'm in the mountains and got an hour of off and on light wet snow on warm ground so nothing stuck. They only mentioned a mix in Mobile, with snow in the extreme northern part of the county. And began backing off of that yesterday. Even then they weren't calling for much. The NAM did show a profile favorable for snow for Washington, Choctaw, and other counties not immediately on the coast up until close to the end. The only thing I've see is an "UNKNOWN PRECIPITATION" at Hattiesburg. So far, it is looking like the North Carolina/ Southern Virginia winter storm back on December 8-10, 2018 will be far and away the biggest winter event of this season for the Deep South, unless we get another potential southern jet stream shortwave that traverses across the region to interact and phase with the polar jet. This has only happened once this winter in this region, and that was for this particular storm. The interesting thing to remember about that storm was that it was only a 1035 mb modified Polar High that had wedged down into the Lee of the Appalachians from the Southeastern Canada / New England region to support that winter storm. It was nothing anywhere near a very potent Arctic High of 1045mb+ for example. Some could argue that this storm was more the Mid-Atlantic region in which the phasing of the jet streams actually occurred. However, there will be no significant cold spells heading toward Dixie at least up until middle of this month. The Southeast U.S. Ridge is back and will dominate most of the region going into the first 10-14 days of this month. We will wait later in the month to see if this thread will be put back into action again. northjaxpro wrote: So far, it is looking like the North Carolina/ Southern Virginia winter storm back on December 8-10, 2018 will be far and away the biggest winter event of this season for the Deep South, unless we get another potential southern jet stream shortwave that traverses across the region to interact and phase with the polar jet. This has only happened once this winter in this region, and that was for this particular storm. The interesting thing to remember about that storm was that it was only a 1035 mb modified Polar High that had wedged down into the Lee of the Appalachians from the Southeastern Canada / New England region to support that winter storm. It was nothing anywhere near a very potent Arctic High of 1045mb+ for example. Some could argue that this storm was more the Mid-Atlantic region in which the phasing of the jet streams actually occurred. You are right. There is always a probability, albeit a small one, that we could have an extreme anomaly to occur, like the March 1993 Superstorm. However, something like that is almost like a once in a lifetime type of event though. That storm was just simply phenomenal in every sense of the word and then some! It is to this day right up there as among the most spectacular weather events I experienced and covered over my career. 1993, the year that Mobile and Birmingham were both reporting thunder snow at the same hour. Thought it was a transformer until I heard the thunder. That was an incredible storm. The pop-up moisture on the south side was odd. Looking like there is a good possibility this season is in the bank (as far as precip goes) for SE. It's been an odd winter. Can't remember the last time we only got Trace of snow for the season in GA mountains. Anyone have any insight into 73 Southeast snowstorm? Was talking to some old timers recently who brought it to my attention. A foot+ of snow in central/S georgia?! (In places that get any snow on the order of every 5-10 years). Thats bonkers. 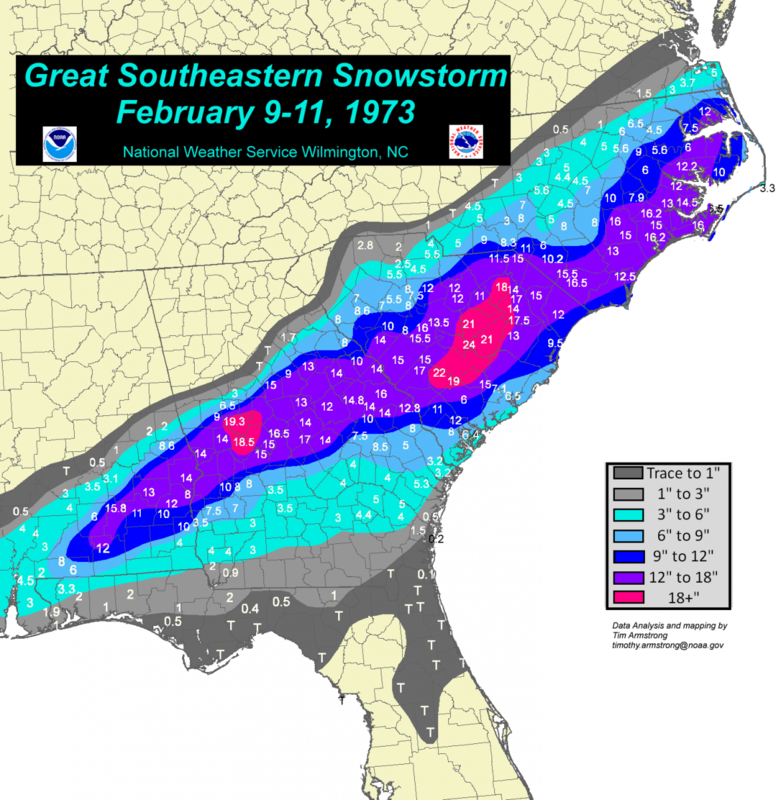 I was sure they were embellishing as Atlanta's all-time record is around 9-10".